Me boire, c’est trouver l’esprit, l’amour, la vie! Isolating the ‘Top Ten’ producers in the appellation was a pretty simple task. Given the importance of the Cave Cooperative, it’s satisfying to be able to include them in this line up. Due to the early drinking nature of these wines and the fact that the wines are rarely seen outside of the country, there are no tasting notes published. The candidates are listed in alphabetical order in both categories. Saint-Pourçain is a wine region that should be regarded more for its historical significance rather than its natural beauty. It suffers from something of an identity crisis; politically, the appellation is situated in the Allier (03), a département within the region of Auvergne, but the topography here is much gentler than that of its contiguous counterparts of Puy-du-Dôme and Haute-Loire. In fact the landscape, architecture and close geographical location make it more akin to Burgundy, which is logical when one considers that Macon is only 150 kilometres to the east of here and that the region’s wines are derived, primarily, from the three classic Burgundian varieties: Chardonnay, Pinot Noir and Gamay. Saint-Pourçain’s connection to the Loire is somewhat coincidental, with the only tangible connection being that the region’s vineyards are located on the banks of the river Allier; the most significant of all the Loire's tributaries. 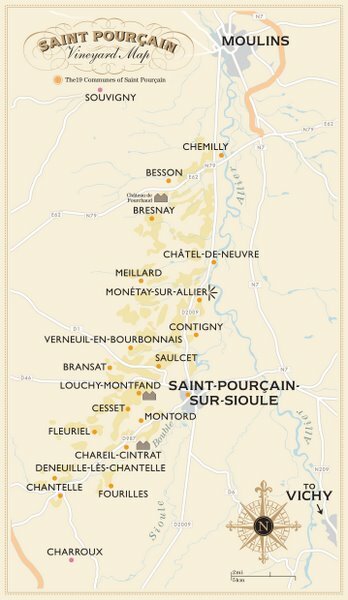 But, for the sake of generic marketing (and this website/book project, at least), Saint-Pourçain is included, despite the fact that any relationship to the Loire proper is nothing more than negligible. The vineyards sit bang in the middle of the département, an area that roughly corresponds to the ancient province of the Bourbonnais, a powerful and influential dynasty which, for two hundred years preceding the Revolution, supplied France with its monarchy. Like the rest of the Auvergne, the countryside has countless feudal châteaux (the Bourbonnais comes only second to Périgord in this respect) and is proof of a turbulent past. Saint-Pourçain itself is an ancient, busy, but also rather dull market town with a population of around 5,000 souls. Sadly, it’s no Sancerre or Saumur and there is very little here to attract the casual visitor. It sits alongside the left bank of the river Sioule, itself a tributary of the Allier , with a medieval abbey-church at its centre. Equidistant from the more vibrant towns of Vichy and Moulins, Saint-Pourcain’s historical importance puts it at the centre of an important intersection that connects the four corners of France and beyond. From Paris in the north, ancient routes divide to deliver travellers to Spain in the south-west, the Low Countries, the Atlantic Coast and east towards the Alps . Travelling south from Moulins, there is very little evidence that there are any vineyards here at all. Clues exist by way of the occasional abandoned terrace on the slopes of the low hills, whilst to the east one passes the flat, alluvial flood plain of the Allier and Sioule. The only obvious agriculture to be seen is fields of cereals and foraging crops which exist alongside pastures of grazing cattle. Recent interest in the wines of Saint-Pourçain, in France at least, is due primarily to its elevation, in May 2009, to become one of the Loire ’s newest Appellation Contrôlées (AC). One of the reasons why it took Saint-Pourçain so long to successfully lobby the Institut National des Appellations d'Origine (I.N.A.O.) was due to what the authorities believed was too much fragmentation and inferior planting material. Although the appellation has now been ratified, this imbalance still exists and will do so for some time to come as old material is grubbed up and new authorized plantings come into production. For the first vintage, at least, it would appear that the I.N.A.O. have taken a relaxed standpoint by not enforcing the cahier des charges (the official legislative document that sets out the rules for any appellation) when it comes to the final blending of the wines, accepting instead that if the spirit of the law is being adhered to by way of correcting the varietal mix in the vineyards, then they will exercise a degree of tolerance in the final assemblage. For how long they will turn a blind eye remains to be seen. But it is not just the I.N.A.O. who wants to accelerate the changes in plantings, it’s the producers too. Shifts in fashion are invariably quicker than the growers can feasibly react to, with one clear example being the current demand (and the resulting shortage) for white wines. The fact that growers are selling the new crop as soon as it can be committed to bottle demonstrates the current imbalance in plantings, but also confirms the positive news that, as far as the growers are concerned, there is no crisis of confidence or oversupply of the wines of Saint-Pourçain. With the first Appellation Contrôlée harvest safely in the cellar, most growers were delighted that the 2009 vintage also happens to be the best in the region for a generation; a gift with which to help promote the recent upgrade. But the final chapter of the elevation to full AC status is still unfolding. In January 2010 the I.N.A.O. came back to the growers syndicate and requested that 46 hectares (about 8% of the existing vineyard area) be either grubbed up or declassified, citing that the soils were either too humid or had too much clay content to be suitable for inclusion within the appellation. The decision affects some 26 growers, mostly coopérateurs, but has a significant impact on the stability of the production within the region. Needless to say these vignerons are contesting the request, asking for an independent appraisal of the vineyards in question. This is set to happen in June, but a decision clearly needs to be reached prior to the commencement of the 2010 harvest. It does seem inconceivable that the I.N.A.O. can partly retract the legislation that they themselves ratified in May 2009 after more than 25 years of negotiation with the various local bodies. As they say in all good news stories, watch this space. From the start of The Middle Ages until the French Revolution, the wines of Saint-Pourçain enjoyed much royal and religious patronage and were the subject of numerous endorsements by the commentators of the day. In 1224, they were cited in Le Bataille des Vins, or ‘The Battle of the Wines’, a poem written by Norman poet Henri d’Andeli. It tells the story of a tasting organised by the Capetian King, Philippe-Augustus (reigned 1180 – 1223) who sent his messengers on a mission to bring back the best wines of France and beyond. He managed to assemble over 70 examples from around Europe which were then tasted and judged by an English priest. Those wines which received the parsons blessing were classified as ‘commended’, whilst the ones that were not were denounced as ‘excommunicated’. The wines of Saint-Pourçain were ranked only behind those of Beaune and Saint-Emilion. Some three hundred years later a French geographer, Nicolas de Nicolay (1517 – 1583), was commissioned by Charles IX to research and present to the king a detailed account of the provinces of Berry and the Bourbonnais . The book, Description générale du Bourbonnais , was published in 1569 and it commended the white wines of the communes of Besson, Châtel-de-Neuvre and Bresnay, which Nicolay specifically noted as a ‘beau bourg et paroisse en bon pays de vignoble produisant quantité de bons vins’. He also recorded that the vineyards of Souvigny were capable of producing ‘encore quatre à cinq cents poinssons de bon vin’ (about 1,000hl) a year. Early in the 1800s, André Jullien (1766 – 1832), a renowned négociant and author of the seminal work for the period, Topographie de tous les vignobles connus, compared the wines of Saint-Pourçain to the best examples of the Mâconnais. Few can deny Saint-Pourçain its claim to being one of the oldest viticultural regions in France . Whilst many others can trace their vineyards back to the times of the Romans, there is a link here to the Phoenicians who founded the colony of Cantilia, modern day Chantelle. Whilst some archeologists remain skeptical, travellers arriving from the Mediterranean could have feasibly introduced the vine as they passed through the region, given that Chantelle was centred on an intersection of a well established route, long before the arrival of the Romans. The Romans did, however, play an active role in introducing the vine as well as founding a settlement in the spa town of Vichy where viticultural objects, including tools for pruning, have since been discovered. These findings, along with others at Monétay-sur-Allier, have been dated to around fifty years before the birth of Christ. But there was also a period in Roman-Gallo history when no wine was produced in the provinces. In 92AD the then Emperor Domitien issued an edict forbidding the culture of the vine in Gaul , presumably to protect the domestic market. Domitien was assassinated in 96AD, but it took two centuries before his ruling was overturned. To the south, in Puy-de-Dôme, further evidence of an active wine trade during Roman occupation exists by way of the thousands of fragments of amphorae found around the volcanic mound of Corent, and is also confirmed in the writings of Sidonius Apollinaris (430–489AD), where, in a letter to a friend near Clermont, he makes mention of the vines in proximity to his residence. Sidonius was a Lyonnais , born into a wealthy Gallic family, and he became governor and later bishop of Arvernum (later Clermont-Ferrand ) from 471AD until his death. Originally known as Mirendense, the town of Saint-Pourçain takes its name from Portianus, a peasant-slave born in the nearby hamlet of Louchy-Montfand and charged with attending to his master’s swine herd. Legend has it that he miraculously restored the sight of his overlord, Mangulfus, who then released him into the hands of the monks of the abbey of Mirande (the monastery established by Saint-Austremoine, Bishop of Arvernum in 286). Portianus became abbot in 481 and achieved overwhelming local support when, in 524, he managed to pacify Thierry (aka Theuderic), son of Clovis and King of the Franks, during one of his more punishing campaigns against the Auvernats. It is said that Portianus performed other miracles during his time as abbot, and by the time of his death, circa 532, he had such a following that the people of Mirendense adopted his name for the town. Religion was an important part of life in 10-13th Century Auvergne, and it was an Auvergnat, William of Aquitaine, who had founded the powerful Benedictine order at the abbey of Cluny in about 910. Prior to that, however, monks had already started to migrate south to try and escape persecution by the Normans who invaded the region in the 9th Century. With the arrival of the monks came the culture of the vine, with the earliest known document being a certificate of sale for a vineyard in Deneuve, now Châtel-de-Neuvre, by Ebrard and his wife, Ermenjard, to Mayeul, the abbot of Cluny, in 969. The vines here were controlled by the Benedictine monks at the abbey of Souvigny, just a few kilometres to the north. It was the feudal lord, Aimard (or Adhémar), lieutenant of the Duke of Aquitaine and an ancestor of the Bourbons who gifted the land and an earlier church, dedicated to Saint Pierre, to the newly formed Benedictine order in around 915. A priory was founded during the mid 10th Century and situated close by is the Maison des Voûtes, or House of Vaults, which was mentioned in an act of Cluny in 1408. Today, it is a private residence, but it was once believed to be the local hostelry for pilgrims visiting Souvigny. In the 17th Century its owner, Jean de Ninerolles, captain and squire of the cité donated the house, gardens, meadows and vineyards to an order of Benedictine nuns, who took possession in 1652 and remained there until the Revolution. Under the guidance and expertise of the Benedictines, Souvigny was responsible for producing the best wines during the 13th Century and it is probably these that were referred to in Henri d’Andelis poem, Le Bataille des Vins. In Saint-Pourçain itself, there is evidence of a long association to the vine by way of the carvings in the abbey-church of Sainte-Croix. Despite producing some of the most esteemed wines in Medieval France, further barbarian invasions and feudal rule during the Early Middle Ages hampered the extension of the vineyards. The legacy of this period is one of lawlessness, with local lords fighting the Crown (and each other) for overall control, but all the time the monks continued to propagate the vine, passing knowledge onto their novices. Over time it was the Bourbons who became the dominant power within the region, eventually establishing 17 separate châtellenies (a type of administrative territory) between Chantelle and Verneuil to enforce their own rule of law. Their power eventually brought stability to Saint-Pourçain and vineyards flourished. The monks were well positioned to take full advantage of their noble protector’s political influence, and the Bourbons overlords themselves also started to show an interest in the local wines. It was during this period that Saint-Pourçain was perhaps best known, with the town becoming an important centre for the trading of wine in the 13th Century adopting, for its coat of arms, a lily and a barrel. It was at this point that the wines began to enjoy noble patronage, with a succession of Capetian, Valois and Bourbonnais kings electing to serve them at the royal table. The oldest known reference rests with Henri d’Andeli’s poem Le Batialle des Vins, but it was Philippe-Augustus (or Philippe II’s) grandson, Louis IX (or Saint Louis - France’s only canonized king) poured them at a banquet in Saumur in 1241 in honour of his younger brother, Alphonse de France, coming of age. The enthusiasm of Philippe IV (aka Philip the Fair or Phillipe-le-Bel after his good looks) for the wines during his reign (1285-1314) ensured that they were widely drunk by the nobility of the time and their reputation was such that nobles settled their debts with Saint-Pourçain rather than with cash. The wines of Saint-Pourçain were served at the coronation of Philippe VI, the Valois King, in Reims in 1328, and in 1360 an ordnance, completed by the Kings Council on the demand of John II, the son of Philippe VI, sought to fix a tax based on the quality of wine entering Paris . This three tier system started with the ‘inferior wines from the Ile de France’ at the bottom, followed by the échelon moyen for the wines of Bourgogne , with Beaune and Saint-Pourçain at its summit. But the kings of France were not the only high profile clients. The period between 1309 and 1378 was the time of the Avignon Papacy, and it was probably Limousin-born Pope Clément IV, (the fourth of the seven Popes to reside in the city, from 1342 to 1352) who started the tradition of serving ‘vin de Biaune (Beaune) et de Saint-Poursain’ at the Papal Palaces in Avignon and Beauvais. Each year, the Popes would order between 60 and 120 hectolitres of wine - although the price is said to have tripled as it passed through several courtiers before it arrived at its final destination. At the time of Charles VII ‘the Victorious’ the dukedom of the Bourbonnais was created, and towards the end of his reign (1422-1461), Charles was to spend the winter of 1455-1456 residing in Saint-Pourçain. By the end of the 15th Century the House of Bourbon had become the most powerful in France and had established its court at nearby Moulins. In 1589 Henri IV (or Henri of Navarre), was to become the first Bourbon king and would have almost certainly drank the wines of Saint-Pourçain. His grandson, Louis XIV, the Sun King (reigned 1638-1715) poured them to celebrate his wedding to Marie-Théresa of Spain 1660. It is believed he drank Saint-Pourçain through the course of his adult life as he apparently considered them light and easy to drink. All this Bourbonnais patronage only served to reinforce the demand for the wines of Saint-Pourçain in Paris . But the end of the monarchy, bought about by the French Revolution, had a catastrophic effect on viticulture as vineyards were confiscated from the monasteries and handed to the people. The result was that some of France ’s greatest vineyards were parceled out into tiny plots - most famously witnessed at Clos Vougeot in Burgundy . By 1810 not a single French vineyard remained in the hands of the church, ensuring that the many centuries of wine knowledge and growing techniques acquired by the monks was either lost or forgotten within the course of a single generation. Whilst some regions, notably Burgundy , managed to regain their reputation over time, others, like Saint-Pourçain, never did. Royal endorsement might well have helped create the reputation for the wines from the 13th Century onwards, but later on demand was generated for more humble wines by the many Auvergnats who migrated north from their homelands in the Massif Central to open bars and cafés in Paris . Like with the rest of the wines of the upper reaches of the Loire and Allier, the most effective route to the Parisien market for Saint-Pourçains wines was via sapins, pine barges constructed further upstream on the banks of the Allier from wood sourced in the Livradois forest. These barges, charged with up to 30 tonnes of cargo each, transported not only wine but also cereals, fruits, vegetables, wood and even coal, with most of the trafficking happening in March and November when the rivers were in spate. The equivalent journey by road was slow (at best 20 kilometres per day), impractical (it would have taken 30 carriages and horses to transport the same load) and expensive (there were tolls levied along the way). Although the distance travelled to Paris was much greater compared to other wine regions that were physically closer to the market, Saint-Pourçain enjoyed a competitive advantage. The sapins were charged with barrels of wine at specially created ports along the Allier ; the most famous of which was established at La Chaize, four kilometres north of Saint-Pourçain, in 1413. From here, the barges followed the course of the river to its confluence with the Loire at Nevers, before heading north to the canal at Briare (established to connect the Loire to the Seine in 1642), or Orléans where the wines would have been transferred to carriages to complete the journey to the capital by road. But using the natural flow of the river came with its own challenges and risks. On the 12th November 1790, a large flood hit the wine port of La Chaize washing away 3,000 poinçons (barrels containing around 320 litres of wine each) during a five hour period, with mariners being forced to abandon their barges. The arrival of the first railways in the mid 1880s signalled the demise for the sapineurs, as well as allowing for greater competition in the Parisien market from a wider source of vineyards, most notably the Midi . Another port, at Contigny, continued to ship wine until as late as 1893 when it was eventually closed and the installation demolished. Although plantings in Saint-Pourçain peaked at around 8,000 hectares in the early 1800s, there was a gradual fall off in quality and the reputation that had taken centuries to build was slowly undermined. But the decline, which had started with the expulsion of the monks at the Revolution and accelerated by the need to compete with the vins ordinaires transported from the south, was nothing to the decimation caused by the arrival of phylloxera. Before phylloxera struck, there were nearly 20,000 registered récoltants in Allier . The louse was first identified in the département on 24th May 1886 at Huriel, close to Montluçon and the first sighting within the Saint-Pourçain was in 1892, in the village of Saulcet . By 1894, phylloxera had established itself in vineyards along the length of the valley of the Sioule. American vines were approved for planting the same year, but vignerons saw this as an opportunity to turn to other forms of agriculture, and changed their focus to planting orchards and cereal farming. In addition to having to replant grafted material at the start of the century, the First World War bought other problems. With no able men to tend to the vines or bring in the crop, it was left to the women and children of the villages to manage as best they could. Post war, there was even more pressure on vineyard sustainability when an agricultural exodus saw labourers leaving the countryside in order to find work in neighbouring towns and cities. A survey conducted in 1924, however, showed that there were still 23,000 récoltants in the Allier département - even though the average holding was less than 50 ares apiece. Saint-Pourçain was granted Vin Délimité de Qualité Supérieure (V.D.Q.S.) on the 20th December 1951, just three weeks before the foundations for the region’s only cave co-operative were laid. The original discussions to establish the possible benefits of a cooperative system began in 1932 and plans were drawn up for a 10,000 hectolitre facility to be built in Venteuil-en-Bourbonnais, but the project fell apart at the last minute. It was left to Marcel Edier, a vigneron based in the hamlet of Breux, to pick up the pieces and become the visionary behind the creation of the Association de la Cave Coopérative de Saint Pourçain in 1950 in direct response to the economic crisis of the post-war years. Building commenced on the 12th January 1952 and the first vintage was delivered to the new facility by the co-operative’s 243 members the same year. By 1960 the facility was vinifying 15,000 hectolitres of wine a year and had 659 adhérents, the majority of whom were polyculturalists. For the first few years the harvest bought traffic jams along the route de Chantille as farmers queued up to deliver their crop. But during the difficult years of the 1960s and 1970s, many consolidated their agricultural efforts and abandoned viticulture altogether, moving towards mixed crop farming and the raising of beef cattle instead. In 1962, the association of the Ordre des Fins Palais was created as a way to honour and maintain old vigneron traditions. The members of the confrérie assemble at fairs, reunions and celebrate the patron saint of wine-growers, St-Vincent, each January; their dress distinguished by the blue and yellow colours of Saint-Pourçain. The re-emergence of the independent grower only really started in the 1970s, along with the revolutionary culture of selling wines in bottle rather than en-vrac. In 1982 a change in the décret saw the name of the V.D.Q.S. abbreviated from Saint-Pourçain-sur-Sioule to just Saint-Pourçain. Almost ten years before this, in 1973, the initial stages had commenced for the region’s ultimate aim of elevation to full Appellation Contrôlée status, with an invitation issued by the growers to the Opération Groupée d’Aménagement Foncier (O.G.A.F. - the equivalent of an integrated land management programme), to look at the delimitation of the vineyard area. Prior to the 1970s, vineyards were highly fragmented with many poorly positioned in the frost pockets at the foot of the slopes and areas where achieving full maturity would always present a problem. An initiative to consolidate parcels and improve vineyard practices was put in place, together with a schedule to eliminate the poorest sites altogether. The opening approach to the I.N.A.O. was made in 1984 when the first dossier was submitted by Roger Chérillat, President of the Syndicat des Vignerons between 1976 and 1989, and technicien, Jean Baudier. The process took a total of 25 years, with Jean-Michel Ferrier, a vigneron-coopérateur in Louchy-Montfand and President of the growers’ syndicate at the time, working with the I.N.A.O. in the final stages leading up to approval. During this intervening period, much progress was made in renewing interest in the region with major investment in both vineyards and cellars. In addition, enlightened growers began to give up polyculture to concentrate solely on viticulture, and their offspring began to return from college in Macon and Beaune with suitable viticultural qualifications. In 2000, there were 476 registered vignerons, mostly coopérateurs, in the appellation with 87% of them owning less that two hectares each. Saint-Pourçain finally realised its objective to become an Appellation Contrôlée on the 28th May 2009 for wines produced from the 2009 vintage onwards. Today plantings in the appellation are stable (even if the I.N.A.O. is currently trying to force it to contract further), although this follows a period of great consolidation which saw 500 hectares re-established between 1978 and 1985. This effectively means that some 80% of the vineyards of Saint-Pourçain are less than 30 years old. cast adrift on the crystalline mineral sea of Central France ’. To draw a comparison between Saint-Pourçain and say, the Côtes de Nuits, is not inappropriate given their orientation is similar. Picture a single south-east facing slope stretching for approximately 35 kilometres between two main centres; Moulins acting as the commercial centre of Dijon in the north and Saint-Pourçain playing the part of the local wine capital, Beaune in the south. The only noticeable difference is that the vineyards of Saint-Pourçain are not the one continuous thread that runs the length of the Côte d’Or. The vines are situated on the same latitude as the Mâconnais, some 150 kilometres to the east. They also lie at the northern limit of the Limagne; a fertile plain which follows the course of the river Allier for 140 kilometres as it heads northwards, passing the conurbations of Clermont-Ferrand and Vichy . The Limagne eventually gives way to gently rolling hills and it is here, on a series of plateaux, separated by the valleys of the Bouble and Sioule, that the vineyards are to be found. To the north of the region the soil is poor and infertile, whilst slopes with sunny exposures and more interesting terroir begin to appear as one travels further south. The vast majority of the vines exist on the left bank of the Allier at an altitude of between 260 and 320 metres, although one finds the vineyards of the commune of St-Pourçain itself mostly on the right bank of the river Sioule, around the hilltop hamlet of Briailles. Two communes, Chantelle and Fourilles, fall on the south side of the river Bouble. There are a total of 19 villages that make up the appellation of Saint-Pourçain. Saulcet is the most densely planted of all the communes as well as being the most important for the number of independent vignerons who are based here. Besson has a large number of vines (there were 245 hectares planted in the commune in 1935), but these are worked, with one exception, exclusively by co-opérateurs. 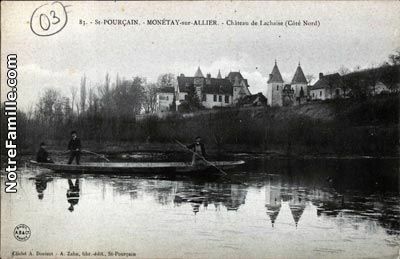 Monétay-sur-Allier had its own port at La Chaise (or La Chaize) and was considered by André Jullien in his book Topographie de tous les vignobles connus published in 1832 to produce the best vin blancs of the region. Wines shipped from here would arrive in Paris carrying the name of ‘Vin de la Chaize’ and parish records in Monétay from around the same period indicate that, with the exception of a dozen boatmen, all the village inhabitants were vignerons. Regardless of origin, the better sites generally survive periods of vineyard consolidation whilst other less distinguished parcels often become casualties. For example in Chareil the lieu-dits of Chassignet, Rosier, Artanges have all been lost, as have the vines around the old port of La Chaise (or La Chaize). The sites that are still in existence today and recognised by their historical name include Les Cailles in Besson (which is farmed by Julien Nebout), Bellevue in Meillard (under the ownership of the Pétillard family), La Pierre Billot in Bransat, Puy Réal in Saulcet and Montfand in Louchy. The vines of La Côte de Breux or the Colline de Breux, can be found on the summit of a small hill a few kilometres to the north of Saint-Pourçain, whilst the wines produced from the vineyards of Briailles were said to be a favourite of Henri IV. Not so much a forgotten lieu-dit but rather a lost commune is the medieval cité of Charroux. Vineyards here used to stretch south-eastwards in the direction of Jenzat where, during the 1760s, the community supported 47 vignerons alone. Today there are sadly none and the village sits outside of the Saint-Pourçain appellation. Saint-Pourçain’s climate is distinctly continental. Winters are cold, but spring tends to arrive early, whilst summers are warm and dry and often extend well into autumn. The average temperature is 12 degrees centigrade and the region enjoys around 1,800 sunlight hours each year. Annual rainfall fluctuates between 510 and 1,020mm, with January and February often being the driest months and June the wettest. As with many vineyards in continental France , hail can present a problem at any point between late May and the end of August. During the Aquitanian Stage, around 20 to 23 million years ago, the region around Moulins and Saint-Pourçain was made up of lakes in which reefs of limestone and travertine (a chemical sedimentary rock formed by minerals precipitating out of water solutions) was mixed up with a variety of other lake deposits and sediments. At around the same time, opposing fault lines created folds in the landscape, forming the Limagne trench and a line of hills and plateaux that now form the left bank of the Allier. This activity ensured that there is a huge diversity of soils types within a relatively small geographical area, although these can be split into three general categories: sedimentary sand, clay-limestone and igneous rocks (granite, gneiss and schists). Starting in the north of the appellation, the vineyards of Chemilly and Besson are situated on hilltops of sedimentary Bourbonnais sand and small, reflective silica based pebbles. These were deposited here by the river Allier between the end of the Micoene Epoch, between 2.5 and 3.6 Million years ago. These sedimentary sands are also found on the slopes closer to the Allier and Sioule, at Châtel-de-Neuvre, Monétay-sur-Allier and Contigny. The general consensus between vignerons is that these soils make the lightest styles of wines in the appellation and more suited to the planting of Gamay for the production of rosé. The volcanic soils, made up primarily of granite, quartz, gneiss and schist, run in a vertical band through the appellation and along its western edge, encompassing the communes of Bresnay, Meillard (mainly granite), Verneuil-en-Bourbonnais, Contigny (where Granite is mixed in with alluvial sand), Bransat, Cesset, Fleuriel, Fourilles and Deneuille-lès-Chantelle and Chantelle. These vineyards, made up of large amounts of silicious material: silex, small pebbles or galets, granite and metamorphic rocks, have a natural affinity to Gamay, delivering solid wines with naturally lower yields. The communes in the south-east of the appellation, Saulcet, Louchy-Montfand, Montord, Chareil-Cintrat, Saint-Pourçain and parts of Fourilles and Verneuil-en-Bourbonnais, tend to be dominated by soils made up of clay, limestone and travertine (which is hard and compact when dry but heavy when wet). These formations molassiques are from the Rupelian (early Oligocene Epoch) and Aquitanian Ages (early Miocene Epoch) and also contain travertine - which used to be mined commercially. These hard bodies of rock crown the peaks of the landscapes in which they occur, whilst the underlying and surrounding locations are made up of marl. The vineyards here form the heart of the appellation and sit on slopes and plateaux between 250 and 300 metres in altitude. Arguably, these soils produce the best wines and it is here that one would expect to find Pinot Noir planted alongside the three permitted white grape varieties. On the right bank of the Sioule, up on the plateau of Briailles the soils are made up of pockets of small pebbles of quartz, not unlike those found in Besson and Deneuille-lès-Chantelle, all of which are capable of reflecting valuable light back towards the vine. It is both useful and important to recognise the trends in planting as Saint-Pourçain moved towards Appellation Contrôlée status. The chart below shows that prior to the Second World War there was an equal split between red and white varieties, but by the end of the 20th Century plantings of Pinot Noir and Gamay accounted for two-thirds of the vineyard area. Something called Gamay Petit Lyonnais was the dominant variety prior to phylloxera, although the origins of this have been lost in time. It was noted for its prolific crop, but fell out of favour in the early 1900s when vignerons adapted Gamay Beaujolais (aka Gamay Noir à Jus Blanc) and Gamay d’Auvergne. The former has become more favoured over the past three decades due to its smaller berries and quality potential. This is now the dominant plant, with about half a dozen clones available through the Institut Technique du Vin at Villefranche-sur-Saône in the Beaujolais; the most popular being 565 which is recognised for its quality potential (at the expense of high yields) or clone 509, which is more productive. Gamay d’Auvergne was noted for its loose but large berries arranged in neat, well aerated bunches making it less susceptible to mildew. Also within the region there are, like most places where Gamay is grown, some rogue Teinturier vines although these are now extremely rare. They are made up of Gamay Fréau (aka Fréaut) and the pink fleshed Gamay de Chaudenay (aka Plant Rouge de Chaudenay, Teinturier de Chaudenay, Plant Gris and Gamay Six Pièces), a semi-teinturier which is believed to be a mutation of Gamay Bouze. Planted within the commune of Saulcet, Domaine Jallet has a parcel of Gamay Beaujolais established in 1900 which is interplanted with Gamay d’Auvergne, Fréau and Chaudenay. It is believed that Pinot Noir was originally established by the Benedictine monks of Souvigny who presumably sourced the material via the abbey at Cluny . The grape was well represented in the appellation prior to Phylloxera, but fell out of favour as growers looked towards the more productive Gamay. Even as recently as 1964, Pinot represented less than one percent of the vineyard area, although this had grown to 7% by 1984 and 15% by 1991. It is generally harvested before Gamay but after Chardonnay. Within the new Appellation Contrôlée laws of 2009, Chardonnay is classified as the principle grape variety for the white wines with Tressallier being designated as a ‘complementary’ grape. Sauvignon Blanc is noted as a cépage accessoire, but there is no obligation for growers to plant it or use it in their blends. Although this seems to have been addressed within the new laws, there was a time when the appellation could have been badly compromised with the I.N.A.O. promoting the use of Chardonnay (and to a lesser extent, Sauvignon Blanc) in favour of the long-established Tressallier. The dilemma comes with trying to balance the desire for absolute quality with the need to maintain typicity and tradition - the risk being that the white wines of Saint-Pourçain could have unwittingly evolved into a distant and nominal satellite appellation of Burgundy . Chardonnay, or Pinot Chardonnay, is generally the variety that is harvested first. As with Pinot Noir, it wasn’t considered important until the late 1970s when Jean Baudier and Jean Berthon instigated a programme of improving the planting material and viticultural methods, after which the variety began to establish itself. In 1964 Chardonnay represented just 1.5% of the vineyard area, but this was accelerated to 30% by 1991 as the I.N.A.O. encouraged growers to adopt it in favour of Tressallier. The Tressallier is the Sacy of the Yonne, although some growers in Saint-Pourçain see it as a close relative rather than the same grape. There are two common beliefs for the origin of its name, the first is the variety has a natural tendency to intertwine or plait itself, tresses in French, or that it might be derived from the Latin trans-Aigerium - from across the Allier . It was once the dominant white variety of the region, but began to decline during the 1980s and 1990s through a combination of pressure from the I.N.A.O. to plant Chardonnay instead, and a question mark over the varieties ability to produce quality wines. Certain commentators at the time were actively lobbying for it to be quietly abandoned, whilst its supporters (rightly) believed that Tressallier offers the appellation a unique proposition. Genetic research (using DNA fingerprinting) caused a great stir in wine circles and even made the international press recently when it was revealed that the parentage of Chardonnay and Pinot Noir was down to a humble (and now almost extinct) variety called Goauis Blanc. (The word gouais is derived from the old French adjective gou - a term of derision). Although it was these two celebrated varieties that received all the press attention, the research showed that Gouais Blanc is the chief ancestor of many modern - and often less well known – varieties, proving that Sacy is a cross between Gouais Blanc (the more dominant maternal parent) and one of the Pinot varieties - such as Pinot Noir or Pinot Blanc - although the true paternal parentage remains inconclusive. Although some grape varieties have been produced by controlled crosses, most vitis vinifera stock in common use is potentially centuries old and created by a spontaneous crossing with domesticated or even wild vines. Researchers, however, believe that Gouais Blanc was not indigenous to northern France but arrived from modern day Croatia with the Romans in the 3rd Century after the emperor Probus (himself a Dalmatian) encouraged viticulture in Gaul and gifted its people with a grape from his homeland. Gouais Blanc is the same as Heunisch Weiss, a variety once widely planted in Eastern Europe . Its transferral to northern France would have made cross pollination with a member of the Pinot family feasible. This research helps rule out the assumption of Pierre Galet in the 1950s that Sacy originated in Italy and arrived in Burgundy in the 13th Century with the monks of the Reigny, an abbey founded in Vermonton in the département of the Yonne. Whatever the origin, the variety was an instant hit with masses of vignerons due to its productive tendencies and distribution increased as far as the Jura in the east and Chablis in the north. In 1732 additional plantings were banned by the Parliaments of Vermonton, Metz and Besançon, citing it rustic and inferior and fit only for peasants. The variety, however, continued to be planted in the Yonne département where it proved to be a popular blending partner with Aligoté - and occasionally Chardonnay - as the base wine for Crémant de Bourgogne. Widely planted in the 1920s, Sacy is still grown in isolated pockets around northern Burgundy , notably in Chitry-le-Fort, about 12 kilometres south-west of Chablis where it has had its own appellation, Bourgogne-Chitry, since 1993. There is at least one grower there, Domaine Edmond Chalmeau, who produces a Bourgogne Grand Ordinaire that is pure Sacy. Tressallier needs severe pruning to ensure low yields which are essential to protect the identity of the grape in the resulting wine. It buds early which, like Chardonnay, puts it at risk to late frosts. Flowering is normally very long and irregular with an extended ripening period, meaning that it is often the last variety in the appellation to be harvested. It is resistant to oidium but susceptible to mildew. The reputation of Tressallier as a difficult variety to grow and fully ripen comes from allowing the vine to over crop. In which case the result is invariably green and neutral high acid wines which are probably best suited as base wine for fizz. If cropped low it can be aromatic with some growers saying it resembles Sauvignon Blanc, although I fail to note this myself. Tressallier is generally the same or slightly lower in alcohol than Chardonnay, but 12% would be considered normal. It’s not considered a long lived variety in bottle and trying to find older examples to taste, even in the growers own cellars is a challenge. Two examples from 1991 and 1993, generously offered from the cave personnelle of the famille Nebout proved (when tasted in February 2010) to be something of a revelation. Neither from distinguished vintages, both were still surprisingly fresh and had the structure and flavour profile of old fashioned Chablis, which I suppose is to be somewhat expected, given the information above. There are two clones of Tressallier available commercially. The first is the generally accepted Sacy clone that comes in from outside of the region, the other, Chemilly, is not highly regarded. Growers such as Domaine Laurent prefer to take cuttings from within the vineyard and propagate their own plants. At the Conservatoire des anciens cépages at Chareil-Cintrat (see below), Tressallier is represented, although some growers point out that the vines are from the official clonal source rather than from massal selection cuttings from within the region. There are around 30 recognised synonyms for Sacy, but the most common apart from Tressallier (or any number of different spellings of the name) are Aligoté Vert, Blanc de Pays, Blanc Moulin, Blanc Vert, Farine, Ferne, Fernet, Gros Blanc, Menu Blanc, Souche, Terzari, Trezailhi, Trezari and Weissklemmer. Long established in the region, Sauvignon Blanc was said to have been established here from monks arriving from Bordeaux . Between 1964 and 1984 plantings increased from 6% to 20% of the vineyard area, although its presence in the white wines is classified as a cépage accessoire where is not obligatory. In fact some growers have none planted at all. It is worth mentioning here the Conservatoire des anciens cépages, a two hectare ‘garden’ of vines planted on the slopes alongside the Château de Chareil. It was conceived, just before his death in 1995, by Jean Baudier, technicien to the growers syndicate, and Jean Berthon, the retired ex-president of the cave co-operative, to protect and conserve the ancient varieties historically grown in the appellation. The first cep was planted by Jean Berthon in 1998, with the balance being established over a two year period. The current President of the Conservatoire is Jean Deschâtres, a retired dairy farmer and polyculturalist (with 4.5 hectares of vines in Montord and Cesset), whose grandfather was a grower in Chareil. As well as containing old varieties, it also demonstrates the old training methods used in the region, such as en échelas, the method commonly used in the Northern Rhône for securing the vine on a single stake. The white grapes have been harvested by Denis Barbera of Domaine Grosbot-Barbera since 2006 for vinification in his cellar. Prior to this the grapes were being delivered to the Cave des Vignerons. Due to the miniscule quantites produced, the white wine is a blend of all the varieties grown above. Simply labeled as Vin de Table, the wine is marketed by the association that manages the conservatoire. The 1,500 to 1,800 bottles produced are sold to a list of subscribers, but can be found on some of the wine lists and in gourmet shops around the region. Having tasted the 2008 and the 2009 in barrel in the cellar with Denis Barbera, it’s a curiosity well worth seeking out. This obscure red grape variety has been established in and around Montluçon for as long as vines have been in the Allier , and at one point its reach extended as far as Châteaumeillant just to the north. The vine is vigorous and productive but very sensitive to spring frost and grey rot. Its late ripening medium sized red-blue berries are contained within compact cylindrical bunches. Le Gouget is as likely to be used as a table grape as it is for vinous purposes since it is only capable of making low alcoholic vin ordinaire, producing thin, acidic wines with little colour or tannin. Synonyms include Gouge Noir, Gougean, Gauget Noir, Goujet and (in the Indre) Lyonnais . Its white counterpart, known locally as Le Gouget Blanc is, in fact, Gouais Blanc. Aligoté once represented around 6% or 7% of the vineyard area of Saint-Pourçain although now is quite rare. The family Touzain still has a small amount planted. Described as making ‘filthy wine’ this variety was included in the original V.D.Q.S. decrét where it was allowed up to 10%. In 1964 it is believed to have accounted for 20% of white grape plantings, although this had diminished to less than 7% by 1991. It was finally written out of the appellation in 2000 and is practically extinct commercially. Saint-Pierre Doré is a very vigourous and productive variety, although it yielded less than Tressallier. It was favoured for its ability to ripen early and was planted as an insurance policy against poor weather conditions arriving later in the season. The wines produced were low in both alcohol and acidity. The theory on the origin of the name Meslier is that it is derived from the Latin mel, or miel in French, meaning honey, a reference to its sweet fruit. It originates from the ancient province of the Gâtinais, in what is now the départements of Loiret and Seine et Marne to the south of Paris . Genetic research has confirmed that it is a cross between Gouais Blanc and Chenin Blanc. It is said to have average vigour but is a productive variety with medium sized, compact bunches with medium sized oval berries. It is sensitive to mildew and oidium but resistant to black rot. Considered an average quality variety, Le Meslier Saint-François produces low alcohol wines with a neutral character that is best suited for distillation and was once widely used in the Charente and the south-west for the production of Cognac and Armagnac . Very little now exists in the region, with Domaine Laurent grubbing up their last remaining parcel, from vines planted in the early part of the 20th Century, in 2000. Synonyms include Gros Meslier, François Blanc, Blanc Ramé, Blanc Remet, Purgarie, Pélegarie, Pelgarie and Orbois. Known locally as Gris Cordelier, there are two Saint-Pourçain growers who have some experimental vines: Denis Barbera has some planted in his 400 metre high vineyard at Montjournal, although this falls outside of the appellation, whilst Christophe Courtinat has 0.28 hectares, planted in 2006, which appears as a Vendanges Tardives Vin de Table. Also known as Dannery in the Allier and was once popular in the village of Verneuil-en-Bourbonnais . The name used in the Montluçonnais for Chenin Blanc. The same grape as found in Muscadet, its origins are in Burgundy . Jean-Louis Pétillat has an experimental block that was established in the 1980s. Recommended: Pinot Gris, Pinot Noir, Sauvignon, Aligoté, Chardonnay, Cot, Gamay, Melon (Muscadet), Romorantin, Tressallier, Verdurant and Blanc Fumé. Authorised: Ravat 6, Seibel 10173, Chenin Blanc, Gamay Teinturiers, Gris Meunier, Landot 244, Muscadelle, Seibel 5455, Seibel 8357, Seibel 8745, Seibel 11803, Seibel 13666, Seyve Villard 5276, Goujet, Grolleau, Saint-Pierre Doré. In the new appellation, the law states that the vineyard should be planted to a minimum of 4,000 vines per hectare, with a maximum spacing between the rows of 2.5 metres and by 0.90 metres minimum within the row. Some very old parcels of Gamay and Tressallier which are now worked by Domaine Nebout were planted to the Burgundian model of 10,000 vines per hectare, but examples of such dense planting is extremely rare. During the 1960s, growers experimented with lower density vineyards, with Joseph Laurent and Jean Ray being the first in the region to adopt the Lenz Moser system which entailed planting 3.5 metres wide rows (to allow for mechanical access) but increasing the density within the row and creating a high trellis. The result was a vineyard of around 3,000 vines per hectare. The new legislation, however, deemed such plantings illegal and some of the last remaining examples, at Domaine Laurent and three hectares of Gamay and Tressallier at Domaine Ray, were grubbed up after the 2009 harvest. Prior to phylloxera, the vignerons trained their vines onto a single stake, a system widely referred to as en échelas in France but known within Saint-Pourçain as en péssiau, using wicker from the locally sourced red osier (willow) to support the canopy. Today, there is an obligation to trellis all the vines, which has also sadly led to the destruction of some of the oldest plantings. At Domaine Jallet, there has been an obligation to remove several rows of centenarian Gamay vines so those that remain can be adapted to growing on trellises. With at least 95% of the vineyard area being harvested by machine (the exceptions being the smallest parcels or young vines, or on slopes too steep for the harvesters to perform safely), then trellising is essential in order to conduct the harvest. The independent growers share a mechanical harvester between them whilst the Cave des Vignerons owns a total of seven. Authorised pruning methods are consistent between all varieties, using Guyot Simple, Guyot Double or Cordon de Royat, the general rule being that Double Guyot is better suited to the richer soils whilst Single Guyot works best on poorer soils. SO4 was widely used in plantings in the 1960s and 1970s due to its vigour, but this is now beginning to be replaced more with 41B which is considered a better all round alternative. Another option is Fercal, which is used in soils where there is a predominance of limestone, thus reducing the incidence of chlorosis. In real terms the appellation is not growing and, as we have seen, the I.N.A.O. has recently tried to contract the vineyard area by declassifying what it considers less desirable parcels. But there has been plenty of consolidation and rezoning with 500 hectares of vines replanted between 1978 and 1985 meaning that some 80% of the vines are less than 30 years old. Another factor in replanting which shouldn’t be ignored is the threat of esca and eutypiose; the phylloxera of the 21st Century. Growers who have experienced the disease in their vines state that it tends to attack vineyards that are around 15 years old. François Ray, vigneron in Saulcet, had to replace 2,000 pieds in 2009; equivalent to half a hectare, or 3% of his vineyard. The figures below indicate the total amount of plantings within the appellation, although not all of these will necessarily be produced as Saint-Pourçain as growers can elect to declassify certain parcels in order to make sparkling wine or Vin de Pays Rosé. In the 2008 and 2007 vintages, 91ha and 68ha respectively were declassified for this purpose. One thing that is certain is that Saint-Pourçain will never again see plantings extend to the 8,000 hectares that existed here in the mid 19th Century. Rosé wines apart, there is an obligation within the new appellation for both the red and white wines of Saint-Pourçain to be blended with no consideration for vins de cépage. Examples exist, however, even from the 2009 vintage, where both red and white wines are being bottled using a single variety: Chardonnay, Pinot Noir, Gamay and even the odd Tressallier. Whilst the new laws clearly state within the Cahier des Charges the minimum and maximum amount for each variety in the blend, this is being widely ignored by the growers and neither does the I.N.A.O. appear to be enforcing it. One theory is that the authorities are more concerned with getting the prescribed varietal mix corrected in the vineyards first and are being more than tolerant in the final make up of the blends. My own view is that there is a degree of naivety on the part of the growers to know what the new laws state, rather than any inherent desire to deceive the authorities. One of the first actions taken in the move towards the elevation to Appellation Contrôlée status was to lower the yields from 65hl/ha (which harks back to the 1951 law) to 55hl/ha. This was done in the modifications to the V.D.Q.S. laws in 2000. For the past couple of vintages the growers have fallen well short of this, with the rendement for the 2007 and 2008 vintages averaging just 34hl/ha for white wines and 42hl/ha for reds. In the 16th Century, Saint-Pourçain was recognised for ‘une grande quantite de vignoble, lequel produit fort bons vins clairets et blancs’, although there is conflicting evidence about the type of wines produced during The Middle Ages. Whilst pale reds might well have been produced, the communes of Louchy and Saulcet are believed to have been planted primarily to white grapes. More recently, swings in fashion through the 20th Century have influenced the styles of wines produced. In 1939 there was an equal emphasis on white wines, although as demand grew for rosés during the 1950s the plantings changed accordingly. Robert Chérillat, an ex grower and former president of the winegrowers syndicate, remembers very little red wine being produced prior to the Second World War. By the 1980s, however, white wines represented just 25% of the total production and this figure has remained static since. But in post-appellation Saint-Pourçain, there is no shortage of demands for white wines, with most growers not having sufficient production to satisfy the current demand. Barrels fell out of favour in the region after the War when technology allowed for concrete, fibreglass or even stainless steel to become the primary vessels for fermentation and the raising of wine. They were reintroduced on a small scale in the late 1980s when Domaine Laurent began experimenting with barrel-aged wines. Since then, several of the top growers make one or two oak aged wines, both red and white, and find themselves with an interesting resource for their oak close at hand. Within a thirty minute drive of the appellation, one can be standing in the famous 10,000 hectare forest of Tronçais , renowned worldwide for the quality of its tight grained oak. In addition to this, many local growers have tapped into an even more local and confidential source. Some thirty kilometres east of Saint-Pourçain is the ‘private’ forest of Jaligny . Given that there are no tonnellieres in the region, the Burgundian-based coopers, Damy (who are based in Meursault) have taken it upon themselves to exploit this source. Barrels are supplied at a much lower cost (about 30% less) than the highly sought after Tronçais, although the age and provenance of the oak are almost certainly identical. With the 2008 vintage, red wines account for 51% of the total production, but this fluctuates each year, depending on the amount of rosé that the growers elect to vinify. In 2007, red wines accounted for 62% of the appellation. The obligation to blend Gamay and Pinot Noir ensures that they look not unlike a Burgundian Passetoutgrains, although the traditional one-third Pinot Noir is not necessarily respected. Until the 2006 vintage, it was a legal requirement that Pinot should represent 20% of the blend, but with the succession to Appellation Contrôlée pending, this was raised to a minimum of 25% (and a maximum of 60%). Gamay therefore is the reverse, with a minimum of 40% and a maximum of 75%. It is normal for the wines to be vinified separately and assembled later, but co-fermentation is allowed. Although confined to the use of two varieties, there is a wide range of different styles of wines produced. Outside the relatively new (and often unsuccessful) trend of barrel ageing, one finds examples of semi-carbonique maceration wines in the fashion of Beaujolais Nouveau, with the Caves des Vignerons launching their own successful equivalent in 1987. Called La Ficelle it is released on the first weekend every December. Other styles tend to be more serious and those that exploit the full potential of Pinot Noir can come close to producing quality levels equivalent to generic or even village Burgundy . Outside of the obvious early drinking carbonic maceration styles, the winemaking techniques remain essentially classical. More innovative technology, such as the use of thermovinification (which is widely used in the Beaujolais and Côte Roannaise) was banned in the Cahier des Charges for the new appellation, despite some growers wishing to retain the right to use this technique in more challenging vintages. White wine production in the appellation has represented 28% and 22% for the 2008 and 2007 respectively, but as previously mentioned the demand currently outstrips supply, which means that growers are either out of stock or rushing to bottle the new vintage earlier than they would like. The appellation laws illustrate the importance of Chardonnay, with growers obliged to use between 50% and 80% within the blend. It is supposed to lend structure and weight whilst Tressallier (with a legal minimum of 20% and maximum of 40%) offers acidity and aroma. Sauvignon Blanc is allowed, but not obligatory, and may constitute up to 10% of the blend. Despite its universal appeal few growers have really embraced it and some have shunned it altogether. According to Pierre Galet (1962), the original décret of 1951 allowed for a maximum of 50% Tressalier, but also accepted up to 10% of Saint-Pierre Doré in the blend. Whites must be technically dry with less than 4grams per litre of residual sugar. The use of Gamay as the sole variety permissible for rosé wines is consistent with the original V.D.Q.S. laws of 1951, although some producers were hopeful that Pinot Noir would be allowed within the new appellation, but it wasn’t to be. There is no one specified method which dictates the production techniques, so the growers are at liberty to use a combination of pressurage direct, maceration or saignée. Every grower’s approach is different and may also change with the quality of the fruit at harvest. The more challenging the conditions, the more they are likely to siphon juice off for the production of rosé in an attempt to concentrate the pulp to skin ratio for their red wines. Although rosé is made throughout the region, it is thought that the sandy, silica based soils in the north of the appellation are best suited to this style of wine. Fashion also dictates how much of the crop is vinified as pink, or even gris, but demand is currently growing and vignerons are dedicating more of their Gamay crop towards it. In 2008, rosé accounted for 21% of the total production, whilst in 2007 it was 16%. The law states that the maximum residual sugar content should be 4 grams per litre. Anything more than this and the wines have been obliged (whilst the Vin de Pays laws still exist) to declassify to Vin de Pays de l’Allier. It is interesting to note that the Cave des Vignerons produce a little rosé from Pinot Noir which carries around 8grams per litre residual sugar. It is sold off from the cellar door en-vrac and exported to the UK under the La Grille label. Many growers offer a bottle fermented sparkling wine in their selection with some, like Domaine Gardien, seeing it as an important part of their business. Whilst some control the whole process, others use the services of Maison Clair in the Roannaise whose speciality this is. The base wine is usually a mix of Chardonnay and Tressallier. The sparkling wine category falls outside of the appellation so the wines are marketed as Vin Mousseux de Qualité. Generally regarded as one the best vintages for the last twenty years, Saint-Pourçain is fortunate to have 2009 as its debut vintage for its accession to full Appellation Contrôlée status. The growing season was kind, although flowering was less than homogenous. One or two communes, notably Saulcet, did see some hail in July that did impact on the size of the harvest. Picking started around the 15th September, which is considered normal for the region, although it was the Pinot Noirs that ripened first when it is normal to start with Chardonnay and Sauvignon. Many of the wines surpass the appellation’s 13% maximum alcohol limit and need to apply for derogation. Good, if now overshadowed by the quality and reputation of the 2009 vintage. The average yield this vintage was 37hl/ha. According to one vigneron, it was a difficult year to extract colour from the reds. This is considered a very ordinary vintage although growers did elect to vinify more red than pink this year. The average yield was 41hl/ha. Deep coloured and rounded wines. Like most of France this is a highly regarded year and considered by many vignerons to be the best vintage in the region since 1983. An early harvest produced excellent, concentrated wines. The best examples should hold for ten years. A very difficult year producing light, peppery reds, but was considered good for whites. A Small and ‘fragile’ crop of just 16,000 hectolitres for the entire appellation due to the torrid heat of the growing season when the vines shut down due to heat stress. The harvest started exceptionally early (Jallet started 3rd September for his old vines) and the resulting red wines are big, heavy and confit with clumsy, grippy tannins. Thankfully, most will have been consumed by now. I systematically asked all the independent vignerons in the region to give me a personal appraisal of their favourite older vintages. Whilst somewhat academic, the general consensus is that these are the harvests which hold fond memories: 1983, 1985, 1988, 1990, 1991 (for white wines, despite the problems during the season which started with a severe frost at budding and wiped out about half of the crop), 1995, 1996 and 1998.